One snake’s ability to shimmy up slippery sand dunes could inspire new technologies for robots that could perform search and rescue missions, carry out inspections of hazardous wastes and even explore ancient pyramids. A new study looked at the North American desert-dwelling sidewinder rattlesnake (Crotalus cerastes), a creature better known for its venomous bite than its graceful movements. But this snake can climb up sandy slopes without sliding back down to the bottom a feat that few snake species can accomplish. To get a closer look at their live study subjects, the researchers headed to Zoo Atlanta, where they were able to examine six sidewinder rattlesnakes. They tested the snakes on a specially designed inclined table covered with loosely packed sand. Fifty-four trials were conducted, with each of the six snakes slithering up the sandy table nine times, three times each at varying degrees of steepness. As the snakes worked their way up the makeshift sand dune, high-speed cameras tracked their movements, taking note of exactly where their bodies came into contact with the sand as they moved upward. The researchers found that sidewinder snakes live up to their name. The slithery creatures moved up the sandy incline in a sideways motion, with their heads pointing toward the top of the incline and the rest of their bodies moving horizontally up the slope. The researchers then looked more carefully at how sidewinders carry out these complex movements. “The snakes tended to increase the amount of body in contact with the surface at any instant in time when they were sidewinding up the slope and the incline angle increased,” said Daniel Goldman, co-author of the study and an associate professor of biomechanics at the Georgia Institute of Technology in Atlanta. Specifically, the snakes doubled the amount of their bodies touching the sand when navigating the slope, he added. And the parts of the snake’s body that were touching the sand during the ascent never slipped back down the slope because the creature applied the right amount of force in its movements, keeping the sand under it from sliding, Goldman told Live Science. To put their newfound understanding of sidewinding to good use, Goldman and his colleagues got in touch with Howie Choset, a professor at The Robotics Institute at Carnegie Mellon University in Pittsburgh. Choset, who has been developing limbless robots for years, already developed a snakelike bot that performs well both in the lab and in real-life situations. However, his slithering machine has run into one particular problem during field tests. “These guys have been making a robot sidewind for years over a wide diversity of substrates, but they had a lot of trouble on sandy slopes,” Goldman said. 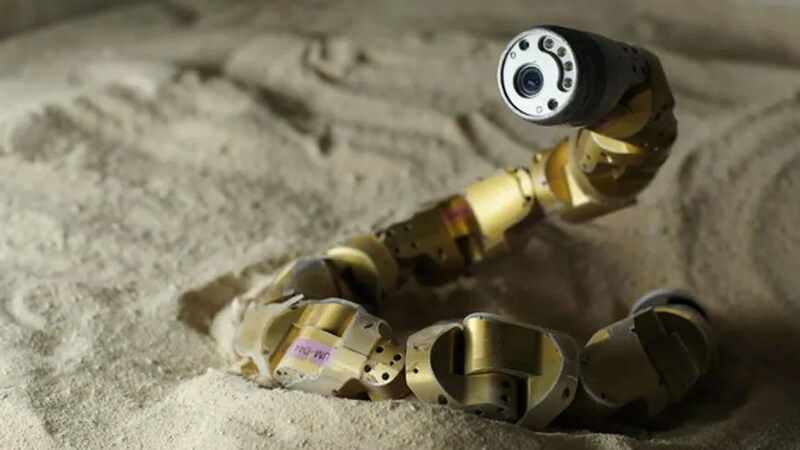 To get the robot moving over sandy dunes, the researchers applied what they now know about the sidewinding rattlesnake’s patterns of movement. They programmed the robot so that more of its body would come into contact with the ground as it slides up the slope. They also applied what they had learned about force, which enables the robot to move its weight in such a way that it keeps moving upward over the sand without rolling back down the slope. Now that Choset’s snake robot can move over tough terrain, it’ll be better equipped to handle the tasks that it was built to tackle. “Since these robots have a narrow cross section and they’re relatively smooth, they can fit into places that people and machinery can’t otherwise access,” Choset told Live Science. For example, these limbless robots could be used during search-and-rescue missions, since the slithery machines can crawl into a collapsed building and search for people trapped inside without disturbing the compromised structure. The snake bot could also be sent into containers that may hold dangerous substances, such as nuclear waste, to take samples and report back to hazmat specialists. Choset also said these robotic sidewinding abilities could come in handy on archaeological sites. For instance, the robots could one day be used to explore the insides of pyramids or tombs, he said. The research represents a key collaboration between biologists and roboticists, said Auke Ijspeert, head of the Biorobotics Laboratory at the Swiss Federal Institute of Technology at Lausanne (EPFL), who was not involved in the new study. “I think its a very exciting project which managed to contribute to the two objectives of biorobotics,” Ijspeert told Live Science. The researchers also achieved the second goal of biorobotics, he said, which is to use a robot as a scientific tool. By testing the different speeds at which the robotic snake could successfully climb up the sand, the researchers were able to pinpoint exactly how fast real snakes make their way up these slippery slopes. The study was published online Oct. 9 in the journal Science.